In light of the the recent natural disasters in Oklahoma, Kansas and throughout the Mid-West, All Hands Fire Equipment is now announcing some important Tornado Safety Tips to be seriously considered. 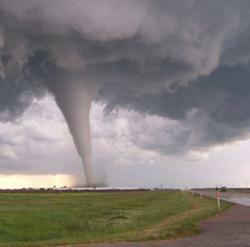 Contrary to popular belief, tornadoes can occur year round and in any location. Some regions of the United States see a significantly higher number of tornadoes due to their unique landscape and geography. According to the Weather Channel, a tornado is defined as a violently rotating column of air extending between and in contact with a cloud and the surface of the earth. Tornadoes are generally spawned by thunderstorms, though they have been known to occur without the presence of lightning. The strongest tornadoes attain an awe-inspiring intensity with wind speeds that exceed 200 mph and in extreme cases may even approach 300 mph. In 2012 there were 936 tornadoes reported by 46 states. The tornado death toll reached 68 with another 829 tornado injuries. More recently an F4 tornado devastated Moore, Oklahoma resulting in at least 24 deaths and 100 injuries. Everyone should be aware of the weather by tuning in to NOAA Weather Radio or local weather radio or television broadcasts. It is vital to heed any warnings that are issued and follow instructions carefully. Maintaining situational awareness and staying alert to changing weather conditions can mean the difference between staying safe and getting caught in the path of a tornado. Storms and unusual cloud formations are the typical warning signs of a tornado, but other telltale signals could include a dark greenish sky, low, dark clouds, large hail, and a loud roar similar to the sound of a train. Refuge should be sought at the lowest point of a structure such as in the basement or storm cellar. When there is no basement or low point it’s crucial to be surrounded by as many interior walls as possible such as bathrooms and closets. Being close to windows and doors is never an option. Additionally hiding beneath a sturdy table can help. Those caught outdoors with no available options for shelter should immediately get inside a vehicle, fasten the seatbelt and drive to the closest secure shelter. If no vehicle is available finding and remaining in the lowest area such a drainage ditches or beneath bridges should be a last option as well has protecting the head and neck with arms and hands. It is always important not to take the threat of any potentially catastrophic weather event lightly, but this is especially true in light of the disaster in Moore, Oklahoma. Anyone living in Tornado alley should be prepared with a safety plan for their families and upon receiving a warning or emergency order, take action immediately and follow directions from NOAA and local authorities.